Adam Festger, Drinking Water & Environmental Contaminant Treatment market manager for TrojanUV, sat down with Water Online Radio to discuss UV trends and technologies. Hear all about TrojanUV’s “Let’s Talk Adenovirus” campaign, as well as the company’s growing installation base and recent product developments. Todd Schnick: We're coming to you live from Dallas, Texas. 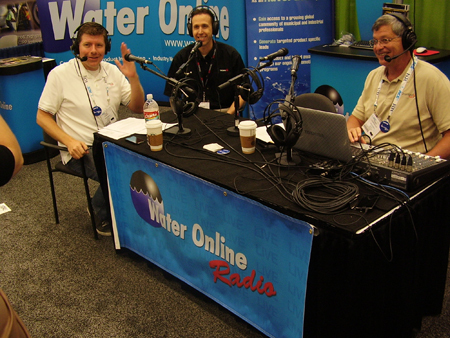 This is day two of AWWA ACE 2012 and Water Online Radio. I'm your host, Todd Schnick, joined by my colleague, Todd Youngblood. Todd, having a great day so far. Todd Youngblood: It is. My head is going to explode if I learn too many more things. We’ve had such a flurry of facts and figures and government regulations and technology so far, we're just getting warmed up. Todd Schnick: Yeah, it's going to be a great day. A lot of good stuff, including our next guest. Please let me welcome Adam Festger, who's a market manager in the Drinking Water & Environmental Contaminant Treatment unit with TrojanUV. Welcome to the show. Adam: Hi. Thanks Todd, thanks Todd. Todd Schnick: Adam, before we get into it, do take a second and tell us a little bit about you and your background. Adam: Sure, I'm the market manager for Drinking Water & Environmental Contaminant Treatment at Trojan. I've got a background in mechanical engineering and hydrology, so studying contaminants in groundwater and where they move and how we treat them, etc. Now I'm in water treatment. Todd Schnick: Tell us what the work you're doing at TrojanUV. Adam: Sure. We use UV light to do two things: we use UV light to remove microbiological contaminants, and we disinfect. The same thing that chlorine does, we do with UV – without chemicals. We also use UV light to destroy chemical contaminant in water. Pesticides or nitrosamines or industrial solvents that might have gotten in water, we can use UV light in combination with hydrogen peroxide to remove those chemicals. Todd Youngblood: Adam, indirect potable reuse is becoming a hot topic with all the environmental concerns and sustainability. I understand you guys are up to your eyeballs in those kinds of projects. Tell us a little bit about them. Adam: It's true. If you look at the trends that are going on in water right now, you're looking at water scarcity, and what it’s driving us as a community to do. Indirect potable reuse is the process of taking wastewater, sewage, and making that drinkable. We help to treat that water to such an extent that it's drinkable. I've actually stood at some water reuse facilities and drank the water straight out of that tap after it's been cleaned with microfiltration, reverse osmosis, and then UV oxidation. That's where we come in. Todd Youngblood: ACE 2012. What's Trojan up to this year's show, and what can people learn that come to see you guys here? Adam: If you come to our booth, we're all bout information this year. Our campaign is called Information is Power. We've got some infographics, they're very informative. You can come and get different facts about our installations, about what's going on in water business, about different applications of UV. Kind of fun ways to present information and give people the information that they're looking for here in Dallas. Todd Schnick: Adam, I'm going to put you on the spot a little bit. My older daughter lives in New York City, so I have concerns about the quality of the drinking water up there. I understand that's one of the several really kind of high-profile, big city projects you guys are involved with. So tell me that my daughter is safe drinking the water in New York. Adam: She should be concerned only in that there are contaminants out there that can be removed with UV. So we're doing that. We’re really, really proud to be part of the New York City facility there, Catskill, Delaware UV Treatment Facility, 2.2 billion gallons per day, if you can get your head around how much water that is. It's an absolutely huge facility. We're just getting that facility online, so your daughter should feel very comfortable here in just a little while when we get that facility going. Very proud to be part of that, and we really think that we're minimizing electricity for that site. We are minimizing maintenance. We are really bringing a solution that New York City was looking for. In the whole procurement process, over five years, Trojan was able to deliver exactly what they wanted. And that's really what we think we can bring to the table for large facilities like that. We can bring solutions that meet customers’ needs. Todd Youngblood: Adam, your UV technology isn't just suited for large municipalities. Small cities need you too, right? Adam: It’s true. Last year we introduced the "Let's Talk Adenovirus" campaign, where we really wanted to talk with operators about UV, and how UV can offer a solution for adenovirus. Treating viruses is a requirement under the USEPA’s groundwater rule. Up until recently, UV has not been a viable option. But we made some advancement in our validation technologies. We validated our UV systems for up to four-log virus, which is something that had never really been done before, and now we can offer UV as a solution for virus treatment. We want to talk about that. That's what we want to say. Come to the booth and let's talk about your options for treating viruses. Todd Youngblood: Adam, when I think about water utilities, they're not exactly welcoming with open arms to new technologies, new processes, new methodologies. You're talking about this adenovirus treatment. What's your view? How do you get folks to accept this kind of a new technology, different technology? Adam: We have the backing of USEPA. When the USEPA says UV can be used to treat viruses – when they wrote the regulations they weren't exactly sure of how we were going to be validating that – but today, in 2012, we can say we have the technology. We have the capability of demonstrating that UV does work for viruses. Yeah, that's part of our conversation we want to have with people. Let's talk about the options. Let's talk about how UV works. Talk about the advantages it brings. If you've got, for example, a customer that's very close to the water treatment plant, you may not have time to get your contact time accomplished. UV can instantaneously treat viruses. In a lot of applications, UV is going to offer a really, really good solution. It's going to fulfill customer's needs. Todd Schnick: Let's shift focus for a second. Let's go up to 10,000 feet and look down on the industry. What trends do you see coming down the pike in the next three to five years? Adam: We talked about water scarcity a little bit. Previously, if a water source wasn't good – if it was impaired for some reason, if it had some contamination – the city might have decided, "Hey, let's just get a different source." Right now, there just aren't a lot of sources out there. A city might actually choose to treat. So UV technologies can be used to treat, for example, taste- and odor-causing compounds derived from algae blooms in a surface water source, for example. It can help to remediate groundwater. So using all the available sources that we've got is a real trend in the water industry. Secondly, I would certainly say doing more with less, minimizing electricity, minimizing maintenance. We've got the TrojanUV Solo Lamp, it's a very, very high-power, low-pressure, high-output amalgam lamp. It allows us to do UV treatment with a minimum of electricity and it also is minimizing maintenance through our chemical/mechanical wiping systems. So we've deployed that lamp in the TrojanUVTorrent in our drinking water offerings. Todd Schnick: Adam, I hate to say it but we're out of time. Before I let you go, where can people get in touch with you and where can they learn about the good work being done at TrojanUV? Adam: Certainly come by our booth. You can register to win an iPad here at Dallas, and www.trojanuv.com is our website, so please head there for more information. Todd Youngblood: The Water Online iPad is better than Trojan iPad, just so you know. Todd Schnick: Adam Festger, market manager of Drinking Water & Environmental Contaminant Treatment with TrojanUV, it's great to have you. Thanks so much for joining us. Todd Schnick: That wraps this segment. On behalf of our guest Adam Festger, my co-host Todd Youngblood, and all of us at Water Online, I'm Todd Snick. We'll be right back with our next guest.